Established in the year 2018 at Virar, Maharashtra, We “Maavishwant Engineering Private Limited” is a Private Limited Company based firm, engaged as the foremost Manufacturer, Importer and Exporter of Dewatering Pump, Diesel Engine Pump, Dredge Pump, etc. Our products are high in demand due to their premium quality and affordable prices. Furthermore, we ensure to timely deliver these products to our clients, through this, we have gained a huge clients base in the market. MAAVishwant Engineering Pvt.Ltd (MVEPL) is an manufacturer & trader and Service of Dredger, Dredger Pump, Dredging Service, De-Watering Pump, Barges, Boat,River Cleaning Pump etc. MEPL largly produce Heavy Duty Suction Pump for Construction & Mining Industries. MVEPL understand how critical mine dewatering is, that is why we offer large line of heavy- duty cast- iron pumps built to withstand the element each equipped with a reliable priming system. MVEPL provide the high volume and solid handling capabilities required to help keep mines running efficiently. 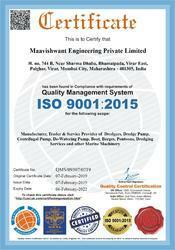 MVEPL is An ISO Certified Company.